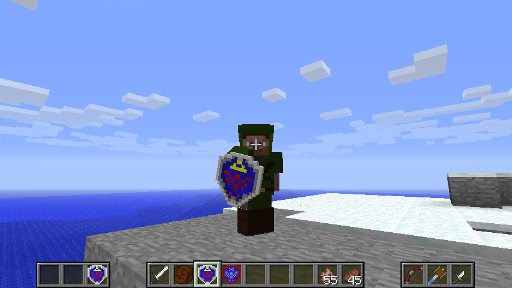 Zelda Sword Skills+ Mod is directly designed for whom fall in love with both Zelda and Minecraft, which means this mod is capable of providing a full-fledged Zelda-like experience in Minecraft, adding a plethora of exciting new sword skills that improve as you adventure, as well as a variety of the old favorites such as bombs and hookshots. In order to provide you with the kind of game you want. List and description of all the different skills and items, along with default keys for activation. Each attack contributes to your current Combo; as the Combo gets bigger, so does your damage! Notes: Damage inflicted is 4 (2 hearts) plus 1 (1/2 heart) per level; knockback also increases with skill level. Notes: Timing is critical to avoid damage, but a dodge is never 100% guaranteed successful. Chance to dodge and timing improve with skill level. Effect: Parries an incoming blow when being attacked; cannot parry unarmed attacks. Notes: Much like Dodge, timing is critical to the success chance of Parry. There is also a chance that the attacker will be disarmed. Timing and chance to disarm improve with skill level. Notes: Damage, weakness duration, range and area of effect all increase with level. 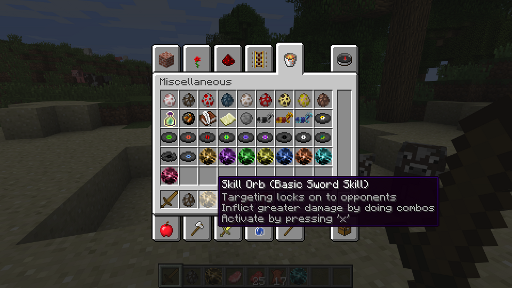 Damage inflicted is based on the sword’s material plus one-half heart per level. Contributes only to Combo damage, not size. Effect: Link’s signature move – hit every enemy as you spin 360 degrees! Barrier blocks cannot be destroyed or moved by any normal means, making them ideal for restricting access. 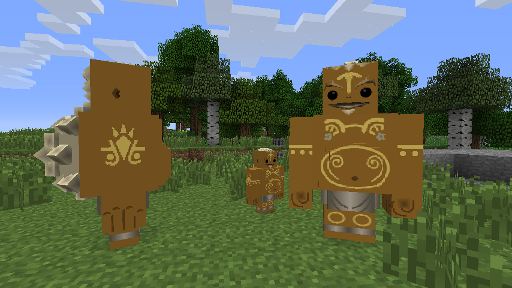 They can be picked up by right-clicking on them with an appropriately powerful pair of Gauntlets, and the Megaton Hammer is capable of destroying barrier blocks, although one must also have the Golden Gauntlets in the inventory in order to destroy Heavy Barriers. Jars can be found all over the place and often yield an item when smashed. Right-click with an empty hand to pick one up, and right-click again to throw it. Right-clicking on a tile while sneaking will place the jar back down. They can also be broken by sword, arrow, hookshot, or explosion. Any item dropped near a jar may be sucked into the jar, and breaking the jar is the only way to retrieve it. 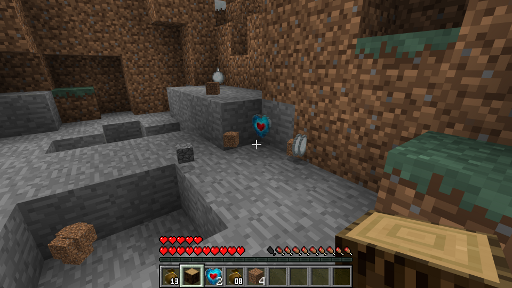 Empty jars have a chance to drop some random item, such as an arrow or rupee. Emerald, arrow, small heart,deku nut, red potion, green potion, standard bomb. 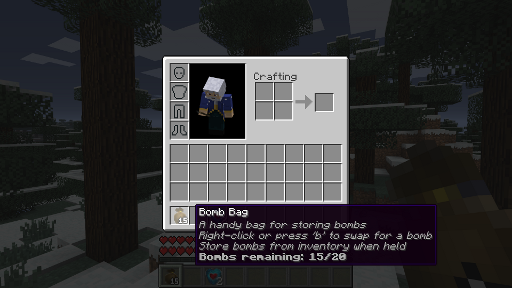 * Note that the jar drops can be edited with tools like FatherToasts custom chest contents mod! 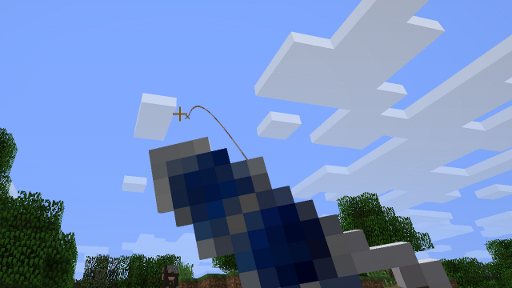 This block comes in two versions: one can be mined using normal tools such as a pickaxe, and the other is completely unbreakable. 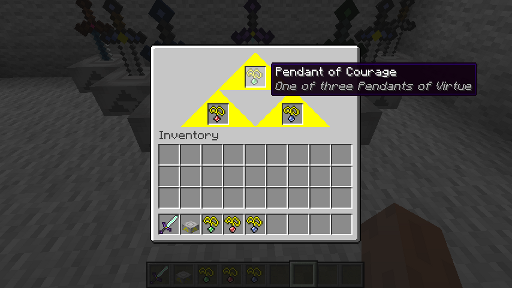 Both versions act as fairy spawners when placed, but do not currently provide any of the other functionality associated with the Zelda dungeons. 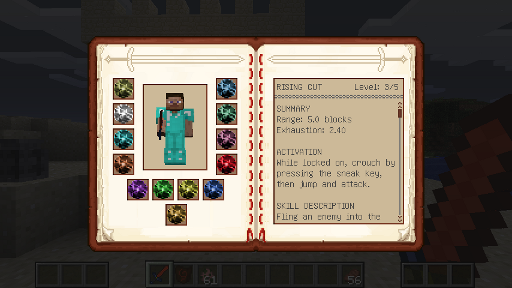 In the same manner as Dungeon Stone, this block is able to assume different block textures by right-clicking on any simple cubic block while sneaking. Dungeon Stone is exactly like Secret Stone in all respects, except it has the additional ability to assume any cubic block texture simply by right-clicking on a block while sneaking. Whatever texture is assumed, that is the block that will drop should the Dungeon Stone be destroyed. 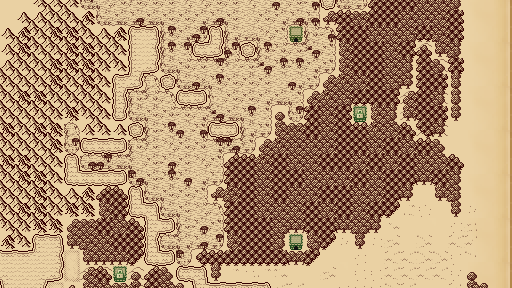 Do note that the block uses a tile entity to provide the texture, so restraint should be used in the quantity of Dungeon Stone blocks placed; too many will create significant lag when loading chunks, just like any other tile entity providing block. 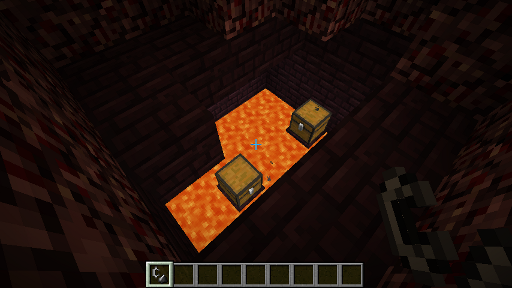 These chests can only be opened with a Small Key; once unlocked, they may be broken normally. Otherwise known as Boss or Dungeon Doors, these can only be removed by activating them with the appropriate key. Another obstacle convenient for blocking off areas, pegs must be hammered into the ground with an appropriately powerful hammer, and can even be destroyed if the hammer is strong enough. If not destroyed, pegs will pop back up over time and must be hammered down again in order to pass. There are three sacred flames: Din, Farore, and Naryu. 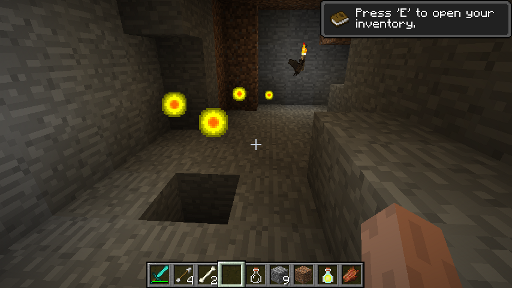 These blocks cannot be removed normally; instead, the player must swing a Golden Sword through the flames, absorbing them into the blade. Unless disabled, sacred flames will rekindle after some number of days pass, though there is currently no way to move them to a new location. While Secret Stone appears to be a standard block, it can not be broken with normal tools and is the main building block of all secret rooms and boss dungeons. The standard version can be destroyed using any explosive, but the boss version can not be destroyed by any means. Typically, gaining entry to a boss dungeon will revert the unbreakable blocks back to normal stone. These blocks can contain any one sword at a time, though they require that the three Pendants of Virtue be ensconced within in order to remove the blade. When home to the Master Sword, sword pedestals put out a constant redstone signal. Fairies are magical flying creatures with incredible healing powers. Just touching one will partially heal Link, and they can be captured in empty bottles by right-clicking on them with a bottle in hand, storing their powers for later. Fairies only spawn in swamps at night, but may rarely spawn during the day in secret fairy pools. These pools are very precious, as the fairies make it their home and never stray far, making them perfect for healing up in a time of need or as a renewable source of fairy bottles. One of the friendly races, Gorons are typically willing to trade a variety of goods and may be found mingling amongst regular villagers. Their large size, tough skin, and hardy nature are a welcome asset to any village, helping to protect against the hordes of enemies. Alone, however, a single Goron can quickly become overwhelmed, and they are too large to fit in traditional dwellings, making it crucial to provide backup or some other form of assistance. An angry Goron will not hesitate to fight back, but will not pursue conflict if the opponent ceases all aggression. The lowly chu is typically easy to deal with in a few sword swipes, but in greater numbers or large size, they can be a force to be reckoned with. Rarer chu types are known to create an electrical aura when threatened, rendering them immune to damage and causing a significant amount of damage to and stunning any foolish enough to attack at that time. All Chus are capable of merging together when their health is low and another chu is about, as well as split apart like slimes when killed, making them a sometimes surprising opponent. This is the weakest chu. It is often found in swamps, and drops red chu jelly. Fairly resistant to fire. Slightly stronger than the red chu, it is not resistant to any particular damage, but its attack may severely weaken any target struck. Drops green chu jelly and is most often found in plains. This is the strongest chu, as well as a highly electrified one. Caution must be used in dealing with this chu whenever its electrical field is up, as striking it directly will instead both damage and stun the attacker. Stun effects, explosions, and waiting are all valid strategies for bringing down the electrical field, though magic damage can penetrate it directly. Yellow chus are of course immune to shock damage and drop yellow chu jelly; they are most often found in the dry deserts. The rarest chu type, blue chus are highly resistant to magic, fairly resistant to shock, and totally immune to cold damage, and are known to occasionally generate electric fields much like their yellow cousins. Blue chus cause cold damage, as well as weakening the target against cold. 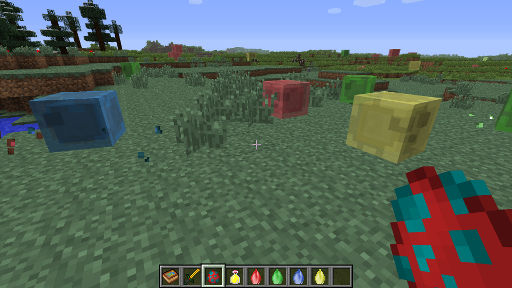 These are highly sought after for their blue chu jelly, and they are most often found in taiga biomes. Keese are bat-like creatures common throughout the land. Weak individually, they can become a danger in swarms, especially to the unarmored. The common Keese has no real special abilities, but like all Keese is capable of evading attacks. 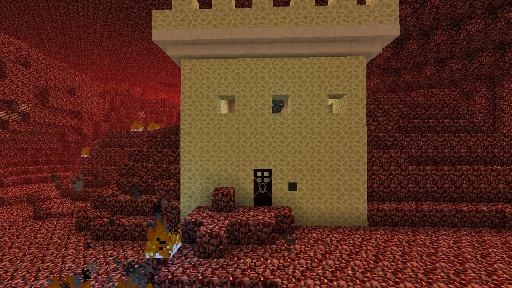 Fire Keese inhabit the Nether region; as such they are immune to fire and can ignite anyone they touch. Ice Keese are native to all cold regions; they are immune to cold and their cold touch causes slowness. Thunder Keese can appear anywhere, albeit rarely. Beware, as they often become electrified. Dark Keese are the rarest, and their cursed touch can cause any number of ill effects. This Zelda classic has the honor of being the first mob added. 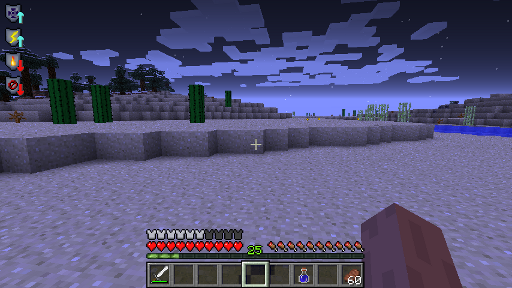 The Octorok spawns in most watery biomes and comes in two varieties: the regular purple version spits rocks, and the rarer pink version spits bombs and, when killed, may occasionally drop water bombs. Shields, functional both with or without Battlegear2! More will be posted as they become available.